Ashley Magee, DVM, DACVS, describes her liver lobectomy technique for removal of solitary neoplasia in two canine patients. Liver lobectomy is performed in veterinary patients for many reasons ranging from removing traumatized or abscessed lobes, to biopsy and removal of solitary neoplasms. While many types of liver neoplasia have an aggressive nature and are associated with a poor outcome, some are known to be less aggressive malignancies or can be benign lesions. These can often be controlled with surgical excision with resolution of clinical signs and excellent survival times. A 13-year-old female spayed Shetland sheepdog mix was presented to DoveLewis for evaluation after an acute onset of vomiting and lethargy, with trembling and increased respiration noted by the clients. They also reported she had a history of chronically elevated liver enzymes of unknown cause. On presentation, the dog was moderately dehydrated and was very tense upon palpation of the cranial abdomen. Heart rate was 130bpm and pulses were noted to be weak. Other vital signs were within normal limits. A CBC and Serum Chemistry as well as thoracic and abdominal radiographs were performed. Anemia (PCV 23%) and marked elevations in ALKP (>2000/ul) and ALT (out of range) were found. One of three dilutions ran yielded values of 2530 for the ALKP and 1738 for ALT. Abdominal radiographs showed a large mass in the cranial abdomen Thoracic radiographs were within normal limits. An abdominal ultrasound was performed. The mass was noted to be extending from the right liver, but the extreme size of the mass limited evaluation of the other lobes. A small amount of echogenic effusion was present. Because of the client’s willingness to attempt surgical removal of the mass, aspiration of the mass or fluid was not attempted, and the patient admitted to the ICU for stabilization and surgery. The dog was treated with intravenous fluids to correct clinical dehydration and pain medications for abdominal discomfort. When recheck packed cell volume had decreased to 21% the patient was blood typed and cross matched and given 250 ml packed red cells. Due to mild prolongation of PTT and APTT and the potential for hemorrhage during surgery, she was also given a matched unit of fresh frozen plasma. Perioperative antibiotics were started. At surgery, a 12 x 14 x 10 cm irregular friable mass was found in the right medial liver lobe and obscuring the rest of the abdomen. No obvious masses were noted in other liver lobes. The mass was isolated from the abdomen and gently dissected away from the gall bladder and quadrate lobe to allow identification of the vascular and biliary supply to the lobe at the hilus. An encircling one-way slip ligature (modified Roeder knot) was made and placed proximal to the proposed resection site. Finger fracture of the surrounding parenchyma was used to further isolate the major vessels prior to ligation. They were ligated with a combination of encircling and transfixing sutures, taking care to avoid impingement of the vessels to the surrounding lobes and gall bladder. The remaining pedicle/parenchyma was crushed/ligated with a TA 55 stapler and the mass removed, leaving the dorsal aspect of the lobe proximal to the gall bladder and conjoined to the quadrate lobe intact. No hemorrhage was noted. The exploratory was completed and the patient closed and returned to the ICU. The dog recovered uneventfully from anesthesia, but she developed worsening anemia requiring another transfusion. 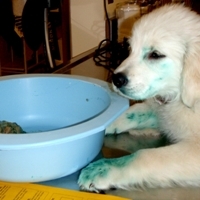 A transfusion reaction and hemolysis, hyperbilirubinemia, inappetence, regurgitation and diarrhea occurred during the post-operative period. She was discharged on the fifth postoperative day for care at home and follow-up with her primary care veterinarian. Histopathologic diagnosis was reported as a completely resected hepatocellular carcinoma. Over the following weeks, the dog’s clinical condition improved dramatically, and her liver enzymes decreased. A 10-year-old female spayed American Eskimo dog was referred for surgery for a solitary liver mass. She had developed a decreased appetite several weeks prior and found to have elevated liver enzymes (ALT 2674, ALKP 364) and a mild anemia (PCV 32%). Abdominal ultrasound and radiographs demonstrated a large, cavitated hepatic mass. Aspirates were collected and were consistent with either a well-differentiated carcinoma or an adenoma. 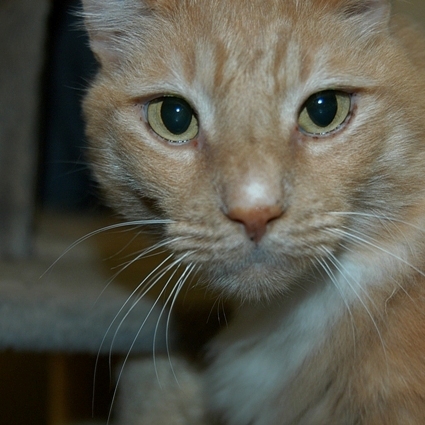 After consultation with a veterinary oncologist, the clients elected to pursue surgical removal of the tumor. On presentation, the dog was QAR with normal vital signs. Cranial organomegaly was detected. Results of PCV/TS, electrolytes, blood glucose and PT/PTT were within normal limits. At surgery, a 9 cm x 12 cm x 8 cm irregular ovoid mass was found in the left medial lobe of the liver. The mass was elevated from the incision and a modified Roeder knot created and placed around the base of the lobe at the proposed resection site and gently tightened. The vasculature entering the visceral surface of the lobe was then individually ligated. Parenchyma distal to the ligatures was separated with finger fracture technique, a TA 55 stapler used to crush the remaining parenchyma and the lobe was removed. A small red nodule was noted on the distal aspect of the right medial lobe and was removed and submitted for biopsy along with the mass. The rest of the exploratory was within normal limits. The patient recovered uneventfully from surgery with no complications. She was discharged on the next postoperative day. Histopathologic diagnosis was a completely resected hepatocellular adenoma. These cases illustrate that large solitary masses of the liver can be removed successfully, although complications can occur. One retrospective study involving 48 dogs with large solitary hepatocellular carcinomas showed that with resection of the tumor, median survival time was over 1,460 days 1. In patients managed medically, median survival was 270 days. Intraoperative mortality rate was less than 5% and similarly metastatic disease was detected in only 4.8% of cases. Factors found to increase complication rate and decrease prognosis were location in the right lobes, and elevated ALT and ALKP, although when intraoperative deaths were removed form the statistical analysis, there was not a significant difference in survival times for patients with right sided tumors versus left. Reported intraoperative complications during liver lobe resection include hemorrhage due to the highly vascular nature of the organ, ligature slippage or retraction of the central vein from within the ligature, exsanguination if the vena cava is damaged, especially when the right liver lobes are removed, compromise to the vascular or biliary supply of neighboring lobes or the gall bladder, and inability to remove the entire neoplasm. Postoperative complications include ongoing anemia, hepatopathy, and ileus and inappetence. Close attention to detail, meticulous surgical technique, and intensive postoperative care can help to minimize these risks and manage complications, but liver surgery should be undertaken only when the client has been thoroughly informed of the potential complications. Many techniques for partial and complete liver lobe resection have been described, including ligation with various circumferential ligatures, parenchymal dissection and individual ligation of vessels, harmonic scalpel dissection, surgical stapler application, surgical vessel sealers (LigaSure) and more. In a recent study comparing five techniques for partial lobectomy2, similar results for surgical time were found, although skeletonization with a suction tip and individually clipping vessels was found to be associated with significantly more blood loss. In the patients of our report, a one-way slip ligature was first created and placed at the proposed ligation site and tightened prior to any digital fracture and individual ligation of vessels in order to minimize blood loss during isolation and ligation. This ligature is similar to that in the commercial premade loop ligatures in the market (Endoloop, SurgiTie) commonly used in laparoscopic procedures. 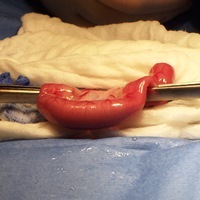 While the diameter of a premade loop is approximately 8 cm in diameter, a hand-tied loop can be made wide enough to accommodate larger liver masses. Dissection of liver parenchyma was limited to that needed to separate lobes and allow application of the TA 55 stapler. A multimodal method of ligating vasculature and separating parenchyma appears to work well to ensure secure hemostasis of vessels and minimize surgical time. 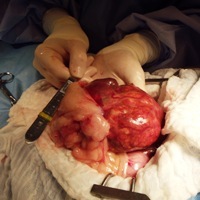 While the discovery of a large liver mass in an aged and potentially debilitated patient can be daunting for the client and fraught with potential complications and unknown variables, a team approach utilizing the skills of the primary care veterinarian, veterinary oncologist, imaging specialists, surgeon and criticalists can lead to a successful outcome in selected cases involving solitary liver tumors. Liptak JM, Dernell WS, et. al. Massive hepatocellular carcinoma in dogs: 48 cases (1992 – 2002). J Am Vet Med Assoc. 2004 Oct 15; 225(8): 1225-30. Risselada M, Ellison GW, et. al. Comparison of 5 surgical techniques for partial liver lobectomy in the dog for intraoperative blood loss and surgical time. Vet Surg. 2010 Oct; 39(7): 856-62.